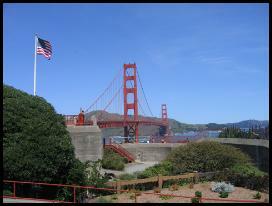 Tur til California 1 - Also checkout our TNG Photos Album. Eivind Oanes and his daughter Ragnhild Knædal fulfill a dream. 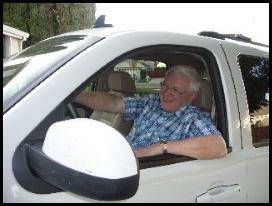 Eivind is not sure about driving such a big car. 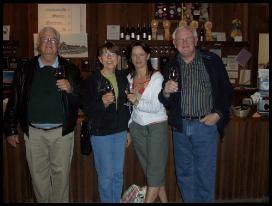 Terry, Jean, Ragnhild and Eivind enjoy a glass of the grape at a local winery. 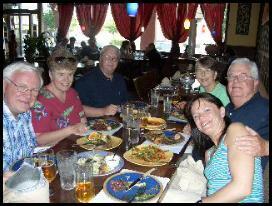 Eivind, Bobbie, Skip, Jean, Terry and Ragnild enjoy a Thai dinner in Tracy. 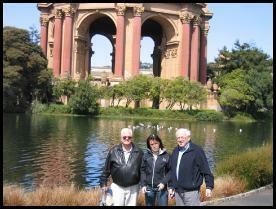 Terry, Ragnhild and Eivind stand in from of the Palace of Fine Art in San Francisco. Eivind and Ragnhild had perfect weather when they visited the famed Golden Gate Bridge in San Francisco. 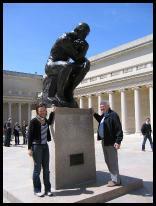 Standing by Rodin's The Thinker, Eivind and Ragnhild visit the Legion of Honor in San Francisco. Trygve Rønneberg was involved with the design of the original Legion of Honor along with the Steinhart Aquarium in San Francisco. 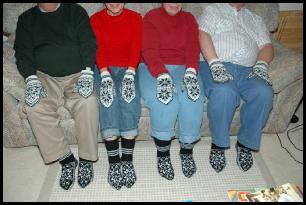 Terry, Jean, Bobbie and Skip show off the hand knitted wool mittens and shocks Eivind and Ragnhild brought from Norway and knitted by Eivind's Aunt Gerd Leiros.